With drought predicted to persist through the summer, an increase in wildfires is more than likely to follow. That’s way HWMO has teamed with a large list of government and non-government organizations across the state to launch the Wildfire & Drought Look Out! campaign, the first coordinated statewide wildfire outreach campaign in Hawaii’s history. Pablo Beimler and Elizabeth Pickett flew to Oahu to join a press conference on May 13th to signify the official release of the campaign. 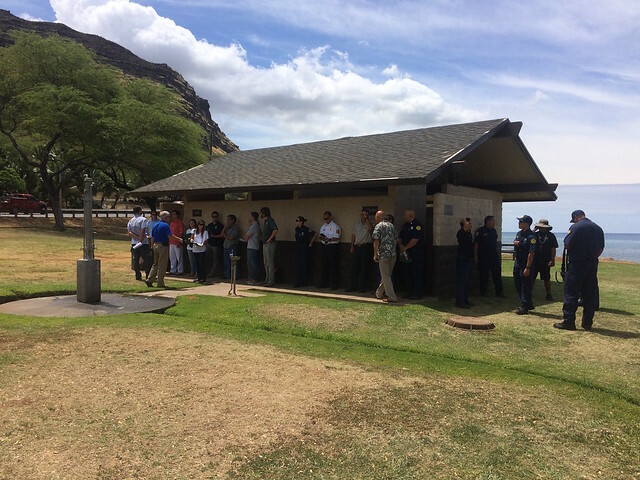 Derek Wroe, NOAA National Weather Service, Rob Hauff, Division of Forestry and Wildlife, Captain David Jenkins, Honolulu Fire Department, and no other than Elizabeth Pickett spoke to a group of media from KHON, KITV4, HPR, Honolulu Star-Advertiser, and others. In the backdrop was the recently charred area right above homes in Nanakuli. Following the press conference, the media drove up to some of the homes along the fire’s edge with Honolulu Fire Department, HWMO, and other representatives. Captain Jenkins led the media around a couple of the homes to showcase the importance of creating defensible space far in advance of a wildfire. Elizabeth Pickett (HWMO) speaks to media with Oahu firefighters standing behind her. In the background: the charred landscape of Nanakuli from the recent fire. News reporters and Honolulu Fire Department talk with residents who experienced the fire first-hand and created defensible space far in advance of the fire. For years, HWMO has made it a goal to have a statewide wildfire outreach campaign become a reality. We are excited to say that this goal become reality and will continue to grow moving forward. HWMO is being embraced as the hub of wildfire info for the state and all of our agency colleagues and fire suppression folks. “We started at Pu'u Wa'awa'a and Waikoloa and worked our way to assisting additional regions and islands with the vision of being useful and utilized in big ways at the state level, and this signifies exciting progress toward that,” says Elizabeth Pickett. Special thanks to Dan Dennison for stepping up as an incredible coordinator of these efforts (and producing the above video) and of course to all of our partners involved in this momentous effort! Tune in to our News Center for links on the press conference on the 13th and any new updates regarding Wildfire & Drought Look Out!